The New York Times calls him the "ambassador for a silenced music." Honored as a peacemaker and virtuoso, Amir Alan Vahab is one of New York's most celebrated and distinguished composer / vocalists of sufi and folk music. He sings in many different languages with a unique mystical style. The virtuosos of Amir weave fiery instrumentals and songs of the Ancient land of the Middle East that include Persian, Turkish, Azeri and beyond. As an instrumentalist, he plays and teaches the tar, setar, tanbour, saz, oud, ney, daf and zarb. He began his musical studies at an early age and by his late teens, Amir Vahab was already an accomplished musician and a music teacher. Amir studied in London from 1976 to 1979 and went to University of Paris from 1979 to 1981. After completing his degree in Linguistics at the University of Paris, he moved to Switzerland to study horology and jewelry design. In 1981, Amir Vahab moved to his current home of New York City. Here in New York, he established himself as a professional musician, both in live shows and in recording studios. He has played before audiences ranging from select private shows to crowds of 6,000 people. In addition, he has composed eclectic music for theatre, film and performed for several television and radio stations (HEAR A RECENT INTERVIEW HERE) in the United States. His performances have been recognized world wide and have inspired many music students to appreciate the classical delicacy of the unique sounds created by the mystical instruments that he has mastered. Today, Amir has seven albums (SEVERAL ARE IN ITUNES) to his credit, for many of which he is the composer, singer and player. In his work, Amir Vahab tries first of all to illustrate the beauty of Iranian traditional music, which he believes is part of the global heritage, and needs to be both taught and preserved. Secondly, he has also attempted to take new approaches to traditional works in order to attract the young generation of music enthusiasts - a venture which has proven most successful. 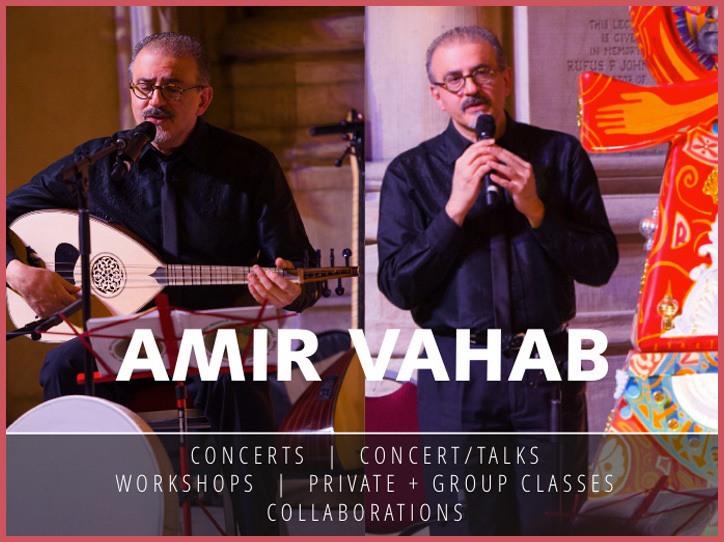 Amir Vahab is currently Teaching and lecturing private and group classes in universities, libraries, museums and cultural centers on the one hand, and organizes music therapy workshops on the other. The Ensemble was formed by Amir Vahab in New York City in 1981 to perform both the mystical music of the Sufis and the folkloric music of different regions of Iran & Turkey. The aim of Amir Vahab Ensemble is to draw the listener’s attention to the spiritual dimension of existence. The ensemble features Mr. Vahab (vocals, tanbur, tar, setar, saz, Oud, ney, daf, Dohol and zarb) together with a rotating group (of over 40 people) from musicians of diverse national and ethnic backgrounds, chosen depending on the focus of the performance. The New York Times calls him the "ambassador for a silenced music." Honored as a peacemaker and virtuoso, Amir Alan Vahab is one of New York's most celebrated and distinguished composer/vocalists of Sufi and folk music. He sings in many different languages with a unique mystical style. The virtuosos of Amir weave fiery instrumentals and songs of the Ancient land of the Middle East that include Persian, Turkish, Azeri and beyond. He began his musical studies at an early age and by his late teens, was already an accomplished musician and a music teacher. Amir studied in London from 1976 to 1979 and after completing his degree in Linguistics at the University of Paris, moved to Switzerland to study horology and jewelry design. In 1981, he moved to his current home of New York City, where he formed the Amir Vahab Ensemble to perform both the mystical music of the Sufis and the folkloric music of different regions of Iran & Turkey. The Ensemble's aim is to draw the listener's attention to the spiritual dimension of existence and features Mr. Vahab together with a rotating group (of over 40 people) from musicians of diverse national and ethnic backgrounds, chosen depending on the focus of the performance. He has played before audiences ranging from select private shows to crowds of 6,000 people. In addition, he has composed eclectic music for theatre, film and performed for several television and radio stations in the United States. His performances have been recognized world wide and have inspired many music students to appreciate the classical delicacy of the unique sounds created by the mystical instruments that he has mastered and teaches: the tar, setar, tanbour, saz, oud, ney, daf and zarb. Today, Amir has seven albums to his credit, for many of which he is the composer, singer and player. In his work, Amir Vahab tries first of all to illustrate the beauty of Iranian traditional music, which he believes is part of the global heritage, and needs to be both taught and preserved. Secondly, he has also attempted to take new approaches to traditional works in order to attract the young generation of music enthusiasts -- a venture which has proven most successful. Amir Vahab is one of New York's most celebrated and distinguished composer / vocalists of Sufi and folk music. He sings in many different languages with a unique mystical style. He weaves together Persian, Turkish, and Azeri instrumentals and songs from the Middle East. Since 1981, Amir Vahab has composed eclectic music for theatre, film and performed for several television and radio stations in the United States. His performances have been recognized worldwide and have inspired many music students to appreciate the classical delicacy of the unique sounds created by the mystical instruments that he has mastered. The New York Times calls him the "ambassador for a silenced music." In his work, Amir Vahab tries first of all to illustrate the beauty of Iranian traditional music, which he believes is part of the global heritage, and needs to be both taught and preserved. Secondly, he has also attempted to take new approaches to traditional works in order to attract the young generation of music enthusiasts - a venture which has proven most successful. Honored as a peacemaker and virtuoso, Amir Alan Vahab is one of New York's most celebrated and distinguished composer / vocalists of Sufi and folk music. His songs weave fiery instrumentals and melodies of the ancient lands of the Middle East that include Persian, Turkish, Azeri and beyond.